From 6 October 1957 until 1 January 1974, British European Airways operated a passenger transfer service between its West London Air Terminal at Cromwell Road, Kensington and Heathrow Airport. The rolling stock fleet was staffed and maintained by London Transport, and this was reflected in the vehicle types operated. By the 1960s, the increase in size of airliners meant that the BEA fleet of AEC Regal IV observation coaches of 1952/3 vintage were offering inadequate capacity, and were approaching replacement anyway. 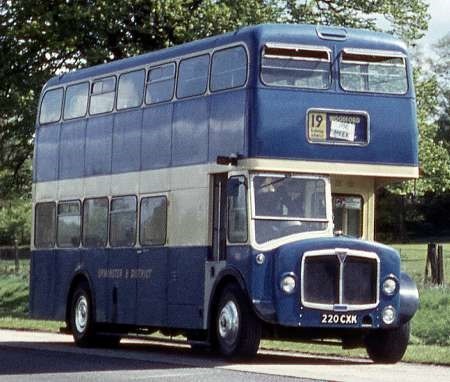 In 1961 an evaluation of the practicability of employing double deckers for the job was undertaken, initially using AEC Regent V, 220 CXK fitted with a Park Royal H38/17F body, the limited lower deck capacity arising from its adaptation to accommodate luggage in the rear portion. Between 1964-66, the 30 ft long front entrance Routemaster RM 1254 was tried out towing a separate luggage trailer, and this experiment was deemed to be successful. Thus, in 1966/67, BEA took delivery of 65 front entrance Routemasters of the shorter 27ft 8ins length with the slightly reduced seating of 56 to allow space for hand luggage at the rear of the lower deck. They had semi automatic gearboxes and AEC AV 590 engines, but were geared for 70 mph running with trailers on the M4 motorway, which would surely not be allowed today. Marshall constructed 88 luggage trailers so that the buses would not suffer luggage loading/unloading delays at the terminals. The Routemasters were delivered and initially operated in the traditional airline livery of blue and white, but, in 1969 the emerging distressing vogue for the use of orange in bus liveries gravely infected the BEA fleet. Mercifully, the merger of BEA and BOAC into British Airways in September 1973 saw the consignment of the execrable orange to oblivion with the restoration of a blue /white livery. The RMAs were progressively withdrawn from airport work from January 1975 until mid 1979, when the entire fleet of 65 was sold to London Transport, thereafter to suffer a curiously chequered, and somewhat wasteful career. In the photo taken at Heathrow in March 1972, orange adorned BEA 41, NMY 641E stands alongside BEA 32, NMY 632E. These vehicles were renumbered RMA 53 and 49 respectively on acquisition by London Transport in 1979. It is thought that both survive – somewhere! Not one vestige of luxury abounded these vehicles – just a normal inside. Not the way to start an air flight, even with non-Transatlantic flights. Was there an equivalent BOAC system such as the one BEA operated here, or did one have to make one’s own way to Heathrow? BOAC operated some Metro-Cammell bodied Leyland Atlanteans during the 1960s between Buckingham Palace Road, London and Heathrow Airport. They were fitted with higher backed coach type seats more suitable to long-haul airline passengers. BOAC’s fleet pre-dated the Atlanteans and consisted of a fleet of single-deck vehicles, although I am not sure about the technical details. Unlike BEA, operations were not subcontracted to London Transport. We have to remember the vogue for these colours in the 70’s- bright and striking and definitely non-traditional- a reaction against formal "liveries". Having said that it was a bit dire! What does seem naff is the choice of vehicle- high floor with perhaps a noisy transmission and speeds for which it was not really designed- with trailer! A Neoplan Skyliner type would be better- but a lot dearer and less patriotic?! Was luggage checked in at the city terminal- so why not just use a van? 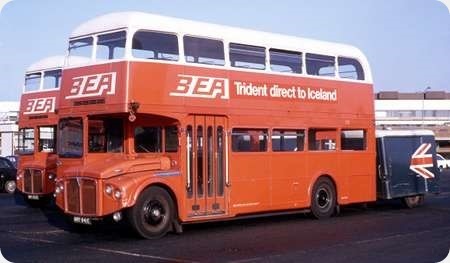 At the same time BEA was still using the one an a half deck AEC Regal IVs from London Transport. they were new in 1953 and had Park Royal bodies. BOAC also had their own fleet of vehicles which operated from their terminal close to Victoria Coach Station. 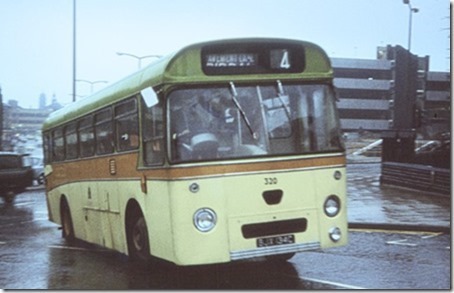 In 1966 they acquired a fleet of Leyland Atlanteans with MCW bodies. Joe – I think you’ll find BOAC left Buckingham Palace Road in the early/mid 70s. My 1978 office looked out on to it and I can remember, at one point, it being used for South Western Services on peak days to relieve pressure on the Coach Station itself. In the days of much smaller coaches they were accommodated in the underground car park of the Coach Station but I feel we’re talking about an era far before Neoplans came on the scene with Trathens. Nick- the Skyliner is celebrating 50 years this year – would it have filled the bill?! So would the Atlantean or even Bristol VR but they weren’t Routemasters! I bow to your knowledge, Joe, but I can recall when Trathens of Plymouth introduced them to their London – Exeter and Plymouth contract for the newly created ‘Rapide’ brand, they were billed as state of the art. Certainly new to the likes of me. They must have been in use elsewhere, I presume, but they’d certainly have done the job! The BEA Routemasters were fitted with AV690 175 bhp engines. In my opinion, these vehicles were the right ones for the job. They had well padded comfortable seats , superb suspension, were nimble and quiet (certainly no problem with transmission noise). They were also a reliable and proven design. The Atlantean may have looked better, but as a tool for the job, would have been inferior. I can vouch for the basic seating of these RM’s, plus also on the "smart" clippies that made a lot of money because arriving travellers had no sterling. Re: Joe’s question "Why not a van?" Surely using a trailer made it much more likely that the luggage got on the same plane as the passengers. Why not a van? Why not? One summer, I drove for a major London Operator – a cruise transfer from Central London to the Liner at the coast. American Tourists with huge amounts of luggage. How will I fit it all in? Oh, don’t worry, there will be a van for that. ….. and there was, a big curtain sided vehicle just for the luggage. Nick, Although launched in 1967, the first right-hand drive UK versions were in service in 1981. Joe, Regarding a van: I was working in Cork in 1975 when the hotel was invaded by by a C.I.E. coach with 40+ American tourists doing the Irish heritage circuit. As they all had about 5 large suitcases, the coach was accompanied by a C.I.E. container wagon. Regarding the trailer, it was seen as a simple, effective solution whereby passengers and luggage travelled together. Even in 1960s London traffic, a bus and a van could easily have become well separated and the essence of the operation was to check in passengers at Cromwell Rd and give a smooth transit at Heathrow for both passengers and luggage. Keeping them together was the key to this. The RM was chosen because BEA had long used LT as its contractor and the RM was its current vehicle just as the Regal was the basis for the half deck coaches and LT’s RF in the 1950s. The shorter version of the RM was chosen as BEA Tridents, Vanguards and 1-11s in service by the late 1960s had seating capacities between 100 and 135. Based on experience of the split between passengers checking in at the airport and those using Cromwell Rd, 56 seats was deemed to be the most viable option allowing room inside for hand baggage. Outbound to Heathrow vehicles were assigned to specific flights with the luggage in the trailers going directly to the aircraft. There were enough vehicles for duplicates if necessary, but in practice this was rare. Inbound passengers picked the first available bus and trailer as they had to pick their luggage in arrivals and, if necessary, clear customs, so it was impossible to keep passengers from any given flight together. Buses departed for London either when full or after a predetermined time after the first passenger had boarded so as not to delay arrival in Cromwell Rd. BOAC and TWA both successfully used Atlanteans with internal luggage space between city terminals in London and Heathrow. To say the Atlantean was inferior is a nonsense as BOAC re-ordered Atlanteans and TWA’s contract with Hall’s of Hounslow specified the Atlantean based on BOAC’s experience. As Allan White correctly states, these did have AV690 11.3 litre engines, though I suspect that they might have been de-rated a bit. This, however, raises an interesting point. If these powerful, very highly geared, fluid flywheel coupled double deckers could run regularly at high speeds without problems, why did the Halifax Lolines suffer such transmission trouble? Forgive me for straying from the main subject to mention the problems with Halifax’s Lolines for a moment. "The transmission was unusual in that there was a transfer box at the rear of the engine which altered the rotation of the propellor shaft and gearbox, but allowed the propellor shaft to run along the chassis side, thus permitting a low floor level. The Dennis mechanic from their Manchester service depot spent so much time at Skircoat Garage that it began to be said he was on the payroll. He was an odd fellow in that he would not show anyone how to do the job or even let them see him working. If an HPT mechanic passed near him he would stop work and cover the job up………………..
…………….Mounted at the back of the engine was the fluid flywheel coupling driving into the transfer box. A major fault on this was a lack of ventilation around the flywheel and transfer box for cooling purposes. So the flywheel got hot, then hotter and hotter still until the oil within it boiled, leaked through and spoiled the oil retaining seal. Alternatively the same might happen to the transfer box. Whichever it was, it was expensive – for Dennis Bros. anyway! The other main problem was the gearbox. Most gearboxes have the input and output shafts rotating the same way i.e. anticlockwise – the same as the engine – but the Lolines were different, they had to have non-standard clockwise rotating gearboxes which were almost impossible to obtain, as no-one else used them. The verdict? It was a love/hate relationship. When they were healthy (and new) most drivers (only short men could drive them comfortably) seemed to like them, but when they were poorly the Lolines were unloved (and unlovely). My opinion? Best left unrepeated!" I do remember being told his opinion – and it was indeed best left unrepeated! I knew many Halifax drivers who had driven them and most agreed that as long as they were going they were great buses to drive (but then to many bus drivers of my acquaintance A Fast Bus=A Good Bus. The main complaint seemed to be that they didn’t like the driving position, with the raked steering wheel (i.e. different to what they were used to) and that the cab roof was too low and had a prominent section of trunking passing across it just above where the driver’s head would be, causing taller drivers to constantly be striking their heads on it. Otherwise they would have to lower the seat to the point where they had to adopt an uncomfortable posture. Speaking purely as a passenger with enthusiast tendencies at the time, I thought they were marvellous vehicles. Even Hilditch later went on to imply that it was a shame at the time he sold them that he hadn’t known that his undertaking would shortly afterwards take over Todmorden JOC with its requirement for low-height double deckers – so even he must have still have harboured positive thoughts about them. Could there have been a certain amount of pressure within the NBC/APT part of the JOC to help West Riding out with Wulfrunian replacements and slightly raise the age profile of the fleet with these comparatively new buses (considering all the older Lodekkas they were having to take on) and it just seemed like a good idea at the time – especially if they’d offered a good price for them ? Who knows ? Dave – I now live 50 miles from Cork City and was actually there yesterday. I think the governing factor behind the CIE van in ’75 would have revolved around the fact that Ireland only established bespoke bus/coach licences comparatively recently. With trailers already a reality, anyone being tested without a trailer on the back of the vehicle would have received a simple ‘D’ entitlement. Now, old fogeys like me, as long as we took our tests on a decker with manual box, would be entitled to an ‘All Types PSV’ which was literally converted to ‘D+E’ when trailers became recognised. When I arrived here in 2007, and not being averse to a few extra Euros in my pocket, I spotted an ad in the local paper for D+E Drivers to drive a tourist road train round a local town. I got the job and found the other, main driver was also English. Any Irish drivers had worked in the UK where they, too, got an old ‘All Types’ licence but actual native D+E licences were as rare as hen’s teeth and I’m suspecting CIE had no option but to use a separate vehicle if they had no D+E drivers. An enlightening posting, John. However, several batches of Lodekkas had the SCG semi auto four/five speed gearbox, and this driveline must have incorporated a step down box in the transmission, reversing the direction of rotation, unless an intermediate cog was used to turn it back the "right" way. Does anyone on here know anything about the Bristol/SCG setup? As for the Dennis engineer’s singular secrecy, perhaps he was out of his depth himself, and didn’t want the customer to witness his struggles. The Lodekka/Loline driving position issue is often debated, and surely comes down to a matter of familiarity – the unusual is generally unpopular with bus drivers (enthusiast types like us are exceptions, of course). All I can say is that I liked it. The Routemaster, having a conventional height chassis and the gearbox remotely mounted towards the back axle, has much more room for cooling air to flow around it. Unlike the Loline which hasn’t. That could have also been a factor.I assume, because of constraints of space under the chassis, the Loline and the Lodekka had their semi auto gearboxes close coupled to the engine, under the stairs, where air flow over them would be even more restricted. Maybe it would have been kinder in retrospect, to have ripped the semi auto boxes out and retro fitted them with constant mesh units. Although, given the hilly terrain of Halifax, that may have created more problems than answers. It would be interesting to know how the West Riding Auto Co. got on with their acquired Lolines. Maybe someone out there knows. Regarding the Dennis fitter. If you are called upon to solve a problem, but are mainly used to working on refuse disposal vehicles and not too sure how to go about working on a bus and its added complications, it must be tempting to avoid public scrutiny, retain an air of mystique, and hide what you are doing from people, who you feel may know far more than you do. But I bet the Lolines must have given him many sleepless nights! Regarding the reversal of drive through the transfer box into the gearbox on a Loline/Lodekka reminds me of a story. In the mid 1970s the Northern General Transport Group, found themselves short of serviceable vehicles, which prompted them to acquire a number of ex Crosville Bristol LD6Bs. It was not long however before the driving staff were complaining about their low power Bristol AVW engines and slow change constant mesh ‘boxes. In an attempt to remedy this the engineering staff successfully managed to fit a Leyland 0600 engine into one of these Lodekkas. However they must have forgotten about the transfer box and its reversal of drive, as they ended up with one forward and five reverse gears. Under those circumstances I do not know whether you would be tempted to laugh or cry! The lack of DE licences in Eire might have been a factor in 2007, but surely not in ’75 when Dave saws the CIE container. D and DE categories only came into being in June 1990 before that HGV and PSV licences were separate documents. My reasoning, John, is that, whereas I’m told the UK introduced bespoke PSV licences in 1931, it could have been well into the ’70s before they were brought in in Ireland and, if they were already aware that trailers existed, there MAY have been some sort of exclusion written into them. I honestly don’t know, so it could have simply been that CIE didn’t have vehicles with tow hooks or trailers to put on them. As something of a side issue, I remember petrol companies advertising for tanker drivers with a note ‘PSV drivers preferred’ because, in those days, you could drive 5,000 gallons of petrol around on a car licence. Roger Burdett’s comment about terrain deserves further exploration. 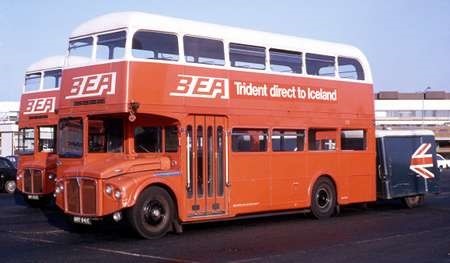 The BEA Routemasters were dedicated to one service which involved sustained high-speed running, without, I imagine, a lot of gear changing. I wonder also if perhaps they had dedicated drivers. The Halifax Lolines were purchased for a long-distance contract, but were also used on local work in hilly terrain, for which their gearing must have been wildly unsuitable. Drivers switching between high and low geared vehicles do not always make the necessary adjustment in driving style. I certainly experienced this every evening going home from work in Bristol, when a cascaded RELH was allocated to one trip on a service otherwise worked by RELLs. None of the drivers seemed to know what to do with it, and the transmission must have suffered significant punishment from being in too high a gear most of the time. A few observations about the operation of the BEA and later BA Routemasters. Whilst geared for high speed running, the first 4.4 miles from the Cromwell Rd Terminal to the end of the M4 was through London Traffic which, even in the early days of the service, could be very slow. The motorway sector to the airport was just over 9.5 miles but though the vehicles could attain 70 mph, they rarely did. From personal observation regularly driving that stretch of the M4 between 1967 and 1976 and, from time to time using the service, 50-60 mph was the norm, as traffic permitted on the motorway sector. The first trailers were built by Marshalls. With different baggage limits in those days, a full bus could be pulling a fully laden trailer with a gross weight of 2 tons. The trailers were replaced in 1973 when check in was moved to the airport. The semi-automatic Lodekka had its gearbox amidship, there being a raised cover beneath one of the offside pairs of seats. The Loline, I am not sure about, but a photograph of the flywheel and step down gear cover in "A Further Look At Buses" (G.G.Hilditch) shows that, next in line, is a U/J and shaft, thereby implying a remote gearbox. This has turned into a most fascinating thread: Front entrance Routemasters v Atlanteans; trailers v vans; BEA livery variations; Halifax Lolines; Loline and Lodekka transmission differences. Wonderful stuff and all grist to the mill. John(S), I enjoyed reading your comments regarding the semi-auto Dennnis Lolines and how and why they performed as they did (or didn’t!) at Halifax. Roger(C), you may well have hit the nail on the head with your point about the Dennis fitter being out of his depth with the foibles of the semi-auto Loline, hence his secrecy – or could he have held the view that "knowledge is power" and didn’t want to share it? Fortunately most manufacturers’ technicians I came into contact with were generally very helpful in troubleshooting, problem solving, offering advice and giving useful tips, but as the saying goes, "there’s always one". Relating to Lodekka gearboxes, the design of the manual gearbox was quite clever. Most gearboxes on a conventional chassis of the time would have the input and output shafts on the same plane, rotating in the same direction, with a layshaft running underneath allowing the various gears to be selected. With the Lodekka having a dropped-centre rear axle and consequently requiring a lower transmission line to match up with it, the drive from the rear of the engine had to be taken down to a lower level in order to mate up with the prop shaft. Bristol did this in effect by using the gearbox layshaft as an output shaft. The input shaft remained at the usual level, but the layshaft beneath now became the output shaft, giving the required drop for the transmission line. (The engine also sloped down slightly to the rear and across slightly to the offside to assist with this). However, by utilising the layshaft in this way, the direction of drive from the output end was reversed, but as the dropped-centre rear axle took the drive from the lower level back up to wheel-centre level by means of an extra gear, the correct rotation of drive to the wheels was restored. Simples! (I do hope all this makes some sense). The manual gearbox was bolted onto the rear of the engine. On rear entrance Lodekkas it was partly beneath the rearward facing seat for five behind the front bulkhead, whereas on front entrance models there was a small protruding cover on the front bulkhead at floor level to accommodate the shape of the gearbox. When semi-automatic transmission became an option on the front entrance Lodekka in late 1966 (the last year of rear-entrance Lodekka production), the semi-auto gearbox was squarer and a little bulkier than the manual version, and couldn’t be mounted in the usual position. Bristol solved the problem by mounting the semi-auto ‘box remotely under the floor partway down the offside of the chassis. (Locating the semi-auto ‘box under the stairs was not really an option, as on F-series Lodekkas that position was taken up by the fuel tank). As Allan mentions, a shallow cover under a pair of seats on the offside gave the game away as to the transmission type. In order to bring the drive down from fluid flywheel to prop shaft level, Bristol used a pair of transfer gears behind the fluid flywheel, which gave rise to the distinctive transmission whine of the semi-auto FLFs. I am unfamiliar with the transmission layout of the semi-auto Loline, but it sounds like it may have been similar in principle to that of the semi-auto Lodekka. Peter, you may be on to something regarding Roger(B)’s comment about terrain being a factor in the Lolines’ reliability problems. Presumably they would have had higher ratio rear axles for their higher speed duties, but which would have made them sluggish on town work. Does anyone know if West Riding considered fitting lower ratio diffs to improve reliability and performance or had they settled down by then on suitable routes? Also, does anyone know of any problems encountered with the semi-auto FLFs, and if so, what were the remedies? The statement by Geoffrey Hilditch in in his book “A Further Look At Buses” suggesting that the five speed gearboxes of the Halifax Lolines were unique to the batch was certainly true when the vehicles were delivered, as the semi auto version of the FLF Lodekka was still several months in the future. However, Dennis had pioneered a four speed semi automatic transmission option right at the beginning of Loline III production in 1961, when it supplied a solitary example to Belfast, and built another for the China Bus Company. A year later the semi auto demonstrator EPG 179B appeared. It must be the case, therefore, that the semi automatic drive line, including the step down gear train, was designed by Dennis. The step down gearing must have been quite costly to produce, particularly since only three examples were made up to the delivery of the five Halifax Lolines in February/March 1967. The Halifax order was preceded by a batch of eight (constant mesh) buses to Reading in December 1966 which marked the resumption of Loline production after a gap of no less than 13 months. These Reading Lolines were fitted with the Bristol gearbox and rear axle, whereas all previous Lolines had Dennis’s own gearbox and axle options. The Halifax Lolines also had Bristol rear axles. By late 1966 it must have been apparent to the Guildford firm that the limited future demand for the Loline did not justify the resumption of manufacturing penny numbers of its own gears and axles when entirely suitable Bristol components could be bought off the shelf. One wonders, then – did Dennis really retain all the casting/tooling equipment from five years previously just to manufacture a mere five more of the complicated step down gear train behind the flywheel, which surely cannot have been a cost effective exercise for Dennis. We know that there was contact between Dennis and Bristol during the Loline production period. Did Dennis subsequently make the step down gears for Bristol, or did the Guildford firm, perhaps, sell/pass on its design work and tooling to Bristol for its own semi auto version of the Lodekka? If only we knew for certain. Roger – Your mention of The China Bus Co (Hong Kong?) reminds me that that was the destination for the Southdown Guys (Arab IVs) when they were eventually pensioned off, but one modification they underwent for service there was some form of auto or semi auto gearbox, much to the disgust of most of us. Does this tie in in any way with your last post? Where did the problem with the Halifax Lolines transmission lie? Was it the fluid coupling, gearbox, back axle or all three, does anyone know. Eastern National’s semi auto FLF coaches must have been high geared also, although their operating territory flatter than Halifax. I would have thought that as Dennis presumably owned the the tooling for the step down gears they would supply Bristol, if an apropriate price could be be negotiated. But its little more than a guess. Even today "airline" luggage presents problems for coach operations. For many years I was involved in dealing with moving passengers from flights by road and each task had to be looked at specifically. A 49 seat coach could often only carry around 25 passengers because of the weight and amount of passengers baggage and it really depended on the airline and the destination/origin on the passengers concerned. We used trailers and even drafted in Pickfords on occasions. For one task we undertook to move an entire cruise from Liverpool Docks by road to Southampton. For this job we drafted in a large number of Pickfords pantechnicons to carry the luggage as it was so much easier. Luggage was sorted into appropriate vehicles prior to loading and was delivered to the right points on the quay for immediate loading. Meanwhile some 40 coaches moved all the passengers without problem as the nightmare of baggage had been removed! In response to John Anderson, one particular feature of the Halifax Lolines that was a cause for trouble was that it was not a ‘pure’ fluid flywheel but the type with a lock up clutch: to paraphrase the late GGH, this was to give engine braking, but if done wrongly engine breaking is what happened. Photographed late on a summer day in 1966 at Stump Cross, a location very well known to our regular contributor and esteemed authority on Halifax matters, John Stringer, is AEC Reliance BJX 134C, No.134 in the fleet of Hebble Motor Services. The bodywork is by Park Royal, seated as DP39F, and the vehicle is seen in typically rugged terrain en route from Halifax to Cleckheaton. Those days of pre political correctness are reflected in the legend “One Man Operation” displayed in the destination box. This Reliance was the last of a batch of four, BJX 131-134, Nos. 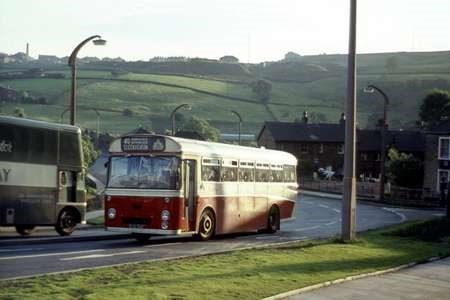 131-134 delivered to Hebble in July/August 1965. The National Bus company took control of the BET bus empire in 1968, and, in the following year, management of Hebble (together with Yorkshire Woollen) passed to West Riding at Wakefield. The subsequent reallocation of services between these companies then saw Hebble expand to twice its BET size, but in 1971 the situation was turned entirely on its head when (to the delight of a certain Geoffrey Hilditch) NBC passed the Hebble business over to the Halifax Joint Omnibus Committee. Of the four Reliances 131-134 (renumbered 666-669 by Hebble in 1970) only the last (shown pictured above) entered the Halifax JOC fleet as No.320 in March 1971, when the bodywork configuration had become B43F, though whether this was inherited as such or was a JOC conversion I know not. I am sure our OBP experts will supply the answer. The 2MU4RA version of the Reliance had the AH470 engine coupled with the Thornycroft six speed constant mesh gearbox which demanded proper respect in use (I drove the Aldershot & District examples so I speak from experience). As far as I can establish, 320 would then have been the only constant mesh gearbox bus in the Halifax fleet since the expulsion of the last Nimbus, a type that was almost (I loved ‘em and drove them at every opportunity) universally detested by the driving staff. I bet 320 was not popular to say the least. A truly comprehensive and lively discussion about the final years of the Hebble company may be found on OBP at this link. Interesting looking lorry passing in the opposite direction. The square stepped wheel arch reminds me of a Guy Warrior. Can anybody identify it? Thank’s Roger, I’ve never been esteemed before ! The problems you suggest may have occurred at Halifax with the arrival of 134 (latterly 669 under the YWD-based scheme) into a synchromesh and semi-automatic fleet did not happen. Towards the end of 134’s time with Hebble one of their Plaxton Panorama-bodied Reliance coaches with synchromesh gearbox (either 20 or 21) suffered a gearbox failure in the Cheltenham area whilst working an outbound journey on the South West Clipper. A changeover (presumably by Black & White) was provided – not exactly a unique occurrence – to continue the rest of the journey to Paignton but no assistance was forthcoming regarding a repair (probably because it was happening too often). Consequently a Hebble mechanic and apprentice were instructed to grab the first Reliance that returned to depot, remove its gearbox, shoot off down to Cheltenham with it in the service van (a very hard worked vehicle) and swap the boxes over in time for their coach to change over the loaned coach on its way back. They then returned to Halifax with the defective box and it was duly ‘repaired’ (probably after a fashion). Then being in a constant state of vehicle shortage there was no time to bother getting the right boxes back into the right vehicles, so 134 received the repaired synchromesh box and retained it for the rest of its days, the coach retaining the constant mesh one. As a result BJX 134C arrived at Halifax JOC (as 320) thus equipped, being no different to their other Reliances. Due to the strange Hebble trim layout it received a most unusual interpretation of the Halifax DP livery, starting out like a DP at the front and ending up in service bus livery at the rear. Here it is seen entering St. James Road prior to turning into the Cross Field Bus Station, Halifax sometime in late 1971. Please forgive the dreadfully out-of-focus shot but it is the only one I ever took of it in this livery. Not long afterwards it was refurbished as a service bus with bus seating, its racks and luggage boot removed and repainted into normal bus livery. It passed into WYPTE ownership in 1974 becoming 3320 but never received PTE livery, being sold for scrap soon afterwards. 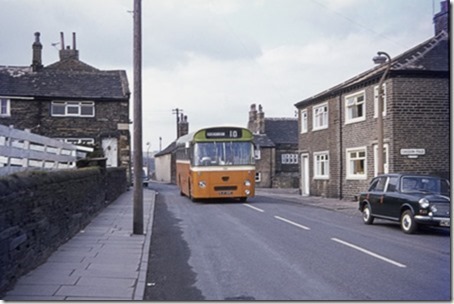 This second photo shows it passing along Towngate, Northowram in the Spring of 1973. Thanks, John. I knew that you would come up with the comprehensive answers – an esteemed authority indeed. You confirm that the conversion to bus seating was a Halifax exercise. Circumstances certainly acted in the favour of this vehicle where the gearbox was concerned. I suppose that is why only this one out of of the batch of four was accepted by GGH. 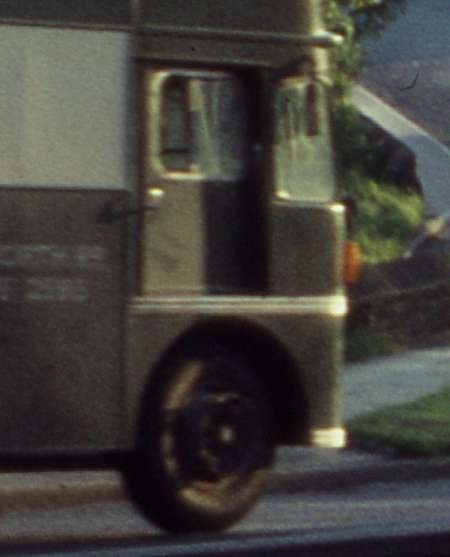 Had it retained its original Thornycroft box in Halifax service I am sure that the gear changes would have been heard right across the West Riding – anything with a crash/constant mesh box was an anathema to the Halifax drivers. Turning to David’s enquiry, I can see the resemblance to the Guy front end, but nothing I can find matches it exactly. Pantechnicons were often built closely to operators’ requirements so you could well be right. I will send a closer view if the front end to Peter to help with identification. Could the body on the pantechnicon be by Marsden/Vanplan.